This third trimester checklist, with printable version, was written by a mom and nurse to help ensure you don’t forget anything to do before baby arrives! It can feel like there is SO much to do before having a baby, so read on to find out what the most important items on the third trimester checklist are! Note: This post may contain affiliate links for your convenience. If you make a purchase, this site may earn a small commission at no additional cost to you. You can read my full disclosure policy here. What Needs to Be Done Before Baby Arrives? As your due date approaches, you are probably mindful of the fact that your to-do list is growing, too! 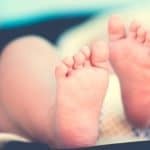 There are many things to do before your baby arrives, from making preparations specifically for the baby to setting yourself up for as smooth of a transition to parenthood as possible. It can feel like a lot to remember, so I’ve listed out the things that you won’t want to forget! 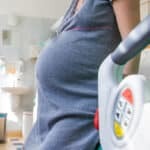 As a mom who has given birth three times and as an OB nurse, I have experienced first-hand the importance of trying to get things taken care of BEFORE the baby arrives. You can read on to find out exactly which tasks I think are worth doing, and I’ve created a printable checklist for you that you can snag at the bottom of the post to make it easier to keep track of what you’ve already done! I think it’s nice to come home from the hospital to a clean house. Many women feel the urge to do this as they get closer to the end of pregnancy (it’s affectionately referred to as “nesting,”). While you don’t have to necessarily scrub your cabinets, you may want to tidy up a bit, declutter some unnecessary items, and do a some general cleaning (or hire a housekeeper to do it as a self-care splurge!). If you have time, you can go ahead and babyproof your house now, but you won’t actually need this done for a while. So don’t sweat it if you don’t fit it in before baby arrives. You don’t want to run out of things you need in the first few days you’re at home. Get your errands out of the way now by stocking up on essentials. Go ahead and buy extra of everything consumable that you use fairly often. Or better yet, set it up for automatic delivery! I have almost all of our household essentials set up to be automatically delivered each month. You can learn exactly how I set it all up in my Shopping Made Simple workbook. Check it out here! I am a big proponent for planning ahead of time for your meals. This can include stocking up on freezer meals and arranging to have loved ones deliver meals to you. Trust me, it will make life WAY easier when you don’t have to worry about cooking dinner each night. Check out my tips for creating a freezer meal plan before baby arrives. Along with stocking up on freezer meals, I think having disposable dinnerware on hand really simplifies mealtime. I’m normally an advocate for limiting waste, but I totally took advantage of paper products after each of my kids were born, and those products were lifesavers. So go ahead and stock up on some paper plates, plastic utensils, and plastic cups for this time of transition. If you have thank you cards to write, go ahead and finish as many of those as you can now, so you don’t have to worry about them later! Nobody wants to be juggling the task of paying bills while also cuddling or feeding a newborn. If you can schedule bill payments ahead of time, that will be one less item on your list! You may already have a name picked out, but if not, at least try to narrow it down to a handful of choices. Some parents like to wait until their baby is born and they “meet” them before officially giving them a name. That is totally fine! But at least having some ideas in mind will make the naming process easier. Take the time to select a pediatrician for your baby. You can get recommendations from family and friends, do internet searches in your area, and often you can even set up a time to meet the pediatrician before choosing him or her as your baby’s medical provider. I found it extremely helpful to meet our pediatrician ahead of time, as I could ask questions, get a feel for how the practice operates, get a sense of whether or not we felt comfortable with this physician, etc. When you go to the hospital to have your baby, they will want to know who your baby’s pediatrician is, so try to decide this ahead of time. Having your baby’s clothes washed and ready will be one less thing to do after birth. Many brand new clothes feel stiff or scratchy, and sometimes they have chemicals on them that can irritate baby’s skin. Get the clothes baby-ready by washing them with a gentle detergent ahead of time. Have baby’s sleep space prepared ahead of time, whether that is a crib, bassinet, or Pack-n-Play. Baby’s sleep surface should ideally be in your bedroom, but babies need their own sleep surface. For my first two babies, we had a Pack-n-Play set up in our bedroom, right next to my side of the bed, so I could easily pick up baby for nighttime feedings. For my third baby, we just set up the crib next to our bed, and that worked fine, too. You actually don’t need to bring very much to the hospital for your baby, as the hospital is well-stocked with the essentials. They have diapers, wipes, onesies, hats, and blankets that you can use while you’re there. However, you will need to bring an outfit for your baby to wear home, and some moms like to choose a special “going home outfit” for this occasion. If desired, you can bring your own cute onesies or outfits for baby to wear while in the hospital, and you can also bring your own baby hats, socks, mittens, blankets or sleep sacks. Booking a photo session is totally optional. Some hospitals offer newborn photo sessions you can participate in while in the hospital. You may also want to schedule a photo session with your favorite photographer, whether in the hospital or after you’re home. Our family chose not to do photo sessions in the hospital, but instead had a photographer take photos at our home a few weeks after we had settled into our new rhythms. Get prepared by installing the carseat! We used a Graco SnugRide for all three of our babies, and it worked really well for us. The Chicco KeyFit is another popular option. Ultimately, the best carseat is the one you can use correctly consistently. Take the time to read the user’s manual, learn about proper positioning of the infant in the seat, and how to adjust the straps correctly. If possible, have a child passenger safety technician inspect your installation. Usually, by the third trimester, you’ve probably had your baby shower and received several gifts. This should give you a pretty good idea of what items you still need to buy. I loved using the Amazon Baby Registry because I could add items to it from any store, and they offer a nice registry completion discount. As a pregnant mom, I wanted to be very intentional about my birth experience. I knew what my hopes and desires were, but I also knew I wanted to be flexible if the situation required it. I did write down a birth plan that outlined my hopes and desires and discussed them with both my husband and my doctor. While I knew things may not go exactly to plan, this process gave me reassurance that we were all on the same page. But let me tell you, as a nurse myself, I disagree, and that type of attitude annoys me. So, I’m going to encourage you to go ahead and write out your birth plan. Talk about it with your provider and your support person. But I’m also going to encourage you to try to keep a mindset of flexibility. When you’re actually in labor, your desires may change (for instance, I thought I would want to walk around a lot, when in reality, that made my pain worse), or circumstances may require something other than what you initially planned. It’s also important to note that some things you want to write on your birth plan may not align with the hospital’s policies, which is why you need to discuss everything with your provider ahead of time, so you all have a realistic understanding of your options. So have a plan, but realize that everything may not go exactly according to plan. Also, if you desire a natural delivery, please prepare for that. I delivered all three of my babies naturally using the Bradley method outlined in this book, but Hypnobabies is another popular resource. Just know that a lack of preparation makes a natural delivery A LOT more difficult. Check out this article from fellow RN Hilary at Pulling Curls about creating a birth plan, and snag her free birth plan template while you’re there. So many women take the time to write a birth plan, but they never write a postpartum plan! As a mom who’s given birth three times AND as an obstetrics nurse, I cannot express enough how important this piece of the puzzle is. The days and weeks after your baby is born can feel like an overwhelming transition. Having a plan in place ahead of time allows you to really consider your preferences and set up resources to help these days go as smoothly as possible. That’s why I created Postpartum Planning Made Simple, a workbook that guides you through creating your own postpartum plan. It covers everything from making financial preparations to arranging for meals to taking care of yourself to enlisting help from others and more! You can check it out here. I am a firm believer that knowledge is power. Taking a childbirth class is a wonderful way to empower yourself and prepare for the birth experience. I realize that it isn’t always convenient to take a childbirth class at the hospital. When we were expecting our first child, my husband traveled almost every weekend for his work and I was working three 12-hour shifts each week, which meant I didn’t usually get home until almost 8pm. So weeknight classes were out of the question, as were many of the weekend classes. We did eventually find a class that fit our schedule, but it was not easy. If you’re like us and you have an unconventional schedule, or maybe you have other children that you don’t want to find childcare for, I highly recommend checking out an online class, like this one from Hilary Erickson, a fellow RN who has many years of experience as an L&D nurse. If you’re not ready to commit to a full online course, you should definitely take her FREE starter prenatal course–sign up here! Touring your hospital (or birthing facility) is a great way to familiarize yourself with where everything is. Find out where you should park when you come in for delivery, where to check in and register, whether or not there are snack machines, etc. If you have older children, bringing them along can help ease some anxiety around the unfamiliar environment. Get all of your final appointments on the calendar, since you’ll likely be seeing your medical provider at least once a week in the last few weeks of pregnancy. 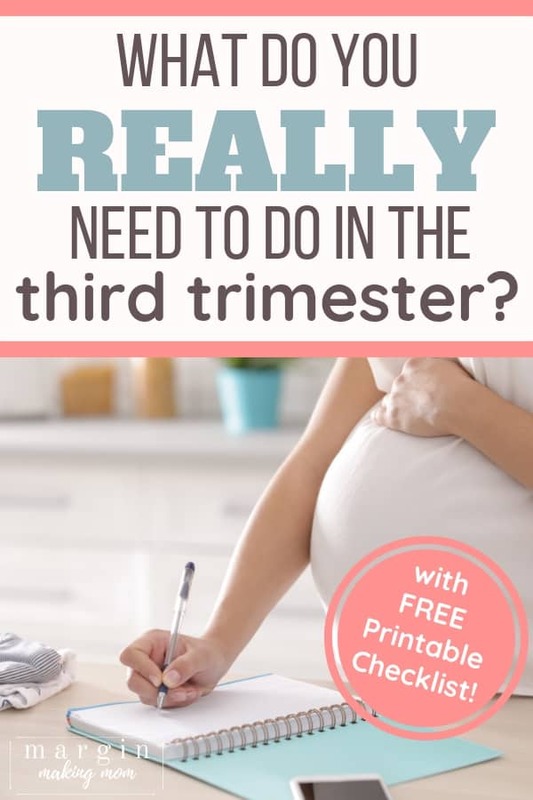 Also be aware of the third trimester testing that is available (learn more about third trimester testing in this FREE online course!). If you’ve created a Postpartum Plan, then you’ve already considered the financial implications of your maternity leave. Planning financially for maternity leave ahead of time can really reduce a lot of stress! Likewise, you may need to make work preparations prior to maternity leave. Think through who will be handling your responsibilities in your absence. If you have other children or pets, have a plan for who will help care for them while you’re in the hospital having the baby or even in the days following your baby’s birth! I recommend packing one hospital bag for labor, another hospital bag for after baby is born, and a separate hospital bag for dad. It’s important to take care of yourself in these last few weeks of pregnancy! Getting as much sleep as you can and continuing some physical activity is helpful. I loved doing exercises from this prenatal DVD and this prenatal DVD, and I would get outside and walk as often as I could (obviously, consult your provider before beginning an exercise program). I recommend having a contractions timer app downloaded to your phone. Now, you can certainly time your contractions without an app (I didn’t use an app for my first two babies). But I found that using the app for my third pregnancy was an easy way to keep a record of the times without having to write everything down, and you can easily see trends in the times. I used the timer in the free Sprout pregnancy app, but there are several options available! You don’t need anything fancy for this. Not all women have their water break prior to getting to the hospital–in fact, many don’t. If your water breaks, it could be a large gush of fluid or it could be a trickle. But either way, it’s a good idea to keep a bath towel or beach towel (I love these microfiber towels because they fold up small but are super absorbent) handy in your car and under you on your bed, just in case. As someone who breastfed all three of my babies and as a nurse who has helped countless moms learn how to breastfeed, I highly recommend taking a breastfeeding class. Knowledge is power, and having some solid breastfeeding knowledge will help you get off on the best foot. It won’t guarantee the journey will be easy, as it’s different for every mom and baby, but it will definitely be helpful. I also think it’s important for your partner to attend, if possible, so they can understand how to best support you. Personally, I breastfed my children in every area of my house. On the couch, on my bed, on a rocking recliner, at the kitchen table, and even while sweeping the kitchen floor (#truestory). It can be helpful to have a breastfeeding caddy or basket, stocked with basic supplies, that goes where you go. One-handed snacks, such as granola bars. Speaking of snacks, you’ll want to have some easy snacks on hand that don’t require much effort to prepare. I learned VERY quickly how to do a lot of things one-handed, because I was often holding or nursing my baby while also trying to eat. You can choose these based on your preferences, but some ideas are pre-sliced fruit, crackers with cheese, pre-cut veggies with hummus, granola bars, and nuts. Especially in the early days, it’s helpful to keep track of your baby’s feedings. You’ll want to track how long the baby ate at each breast and which side they ate at last. You can write this on a notepad if you prefer. I personally never used an app for this–instead, I wrote down feedings and used this bracelet to keep track of which side the baby ate at last. But a breastfeeding app could simplify things if you usually have your smartphone handy! One that is worth looking into is the Baby Breastfeeding Tracker. Take the time before baby is born to find out what resources are available to you. Whether that’s knowing which friends and family are available to help out, to identifying lactation support in your community, to figuring out who to call if need emotional support, go ahead and make some lists that you can refer to later, if needed. Whew! You made it to the end! I know that’s a lot to take in, and I only recommend tackling one or two things at a time. 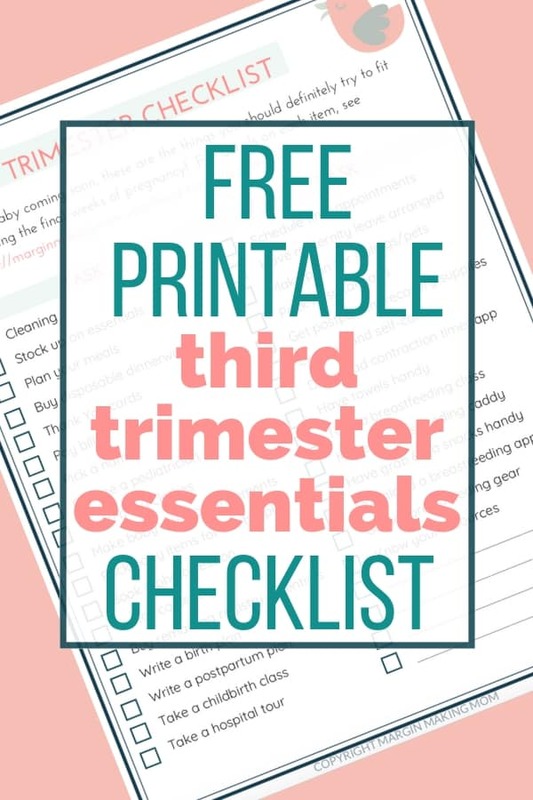 To make it easier to keep track of what you have or haven’t done, I created a FREE printable third trimester checklist pdf that you can print out and use! Included with it is my hospital bag checklist, too, so you’ll be able to knock that off the list as well! Simply fill out the form below to have your free copy emailed to you!